Shelly and I have written several times this year about the rising grassroots movement speaking out loudly against the unprecedented increase of federal spending, so when our Congressman hosted a town hall meeting close to my house, I had to go. My mom and I showed up last night not quite knowing what to expect. We were confident it wouldn't be rowdy like other town halls we've seen on tv, as our Congressman is known to be an outspoken opponent of the Democrat proposed Healthcare reform plan. However, we did consider the possibility that supporters of the President/DNC plan would show up intending to disrupt the meeting. Walking up to the school and into the cafeteria, I immediately noticed the age of the crowd. Sure, I saw a few people my own age that I recognized, but the overwhelming age of the crowd was over 60. Those attending didn't look like political operatives or wheelers and dealers - they looked like ordinary people I might see at the grocery store. Congressman Olson received little disruption from the audience as he went through his presentation on what's happening in Congress and highlighted his stance on the current Democrat Healthcare reform bill. One guy on the front row who looked like he was about to jump out of his seat to debate the Congressman, but to his credit he kept his shout outs in check and waited for the right opportunity to ask his questions. What was really interesting was how agitated people were during the meeting. It wasn't that they necessarily disagreed with him, but they came to voice their opinions and be heard. Everyone there, including myself, wanted to see our national representative agree with us, to see that he is out there trying to represent us, to confirm our belief that there are people in Washington D. C. who do listen to their constituents. There were really some great moments that sent chills up my spine - when we all placed on hands on our heart to Pledge Allegiance to the Flag; when the 10th Amendment was read aloud; and when everyone jumped to their feet in wild applause at the Congressman's statement that raising taxes in America is not the solution to our problems. It was a wonderful opportunity to hear my Congressman speak about what solutions he envisions for our nation, on so many topics. He reassured us that the problems the GOP has had with congressional spending and not being true to their convictions is a thing of the past for the majority of the delegation. The GOP defeat in 2006 had an impact. They know the voters were cleaning house of elected officials who had gone back on their promises. He reminded us that We, the People, are an integral part of the solution to America's current trouble. Our Congressmen and Senators are fighting for us, but we need to continue to speak with our friends, family, and neighbors about what we believe in and what we want to see happen in our country. We must stand up and pay attention - the issues are just too important to ourselves, our children and grandchildren. 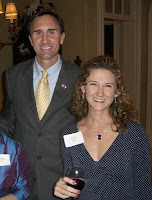 * The picture of Congressman Olson and myself was taken in 2008.